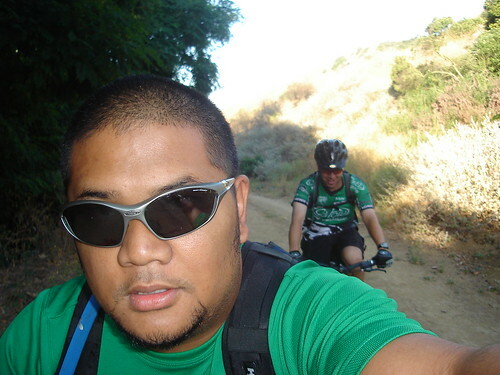 A few weeks ago my long time biking buddy Mikey Monte and I were up in Turnbull Canyon in Whittier Ca. The trail has a 2 mile climb and its pretty boring too. 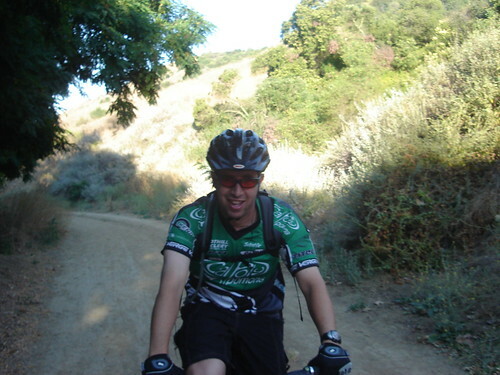 Since Mikey and I have ridden this trail before, he decided it would be a good idea to take his MP3 player along for the climb and then take it off during the single track and descent. This is Mike and I on our way up to the top…don’t worry I was had my helmet on my bars, it was too hot to wear it during the climb. (back to the story)…with his right hand. But he started gaining some speed coming out of Rattlesnake. Mikey decided to scrub some speed by applying the brakes gently…but he didn’t realized that his new disc brakes are far more sensitive than his previous V-brakes. Mikey Endo’s, in other words, he goes over the bars. As he’s doing all this acrobatic moves, I am about 50 yards in front of him. Mikey lands on is left shoulder, and starts to scream like crazy! I hear him…then I slam on my brakes and turn around and I see a big cloud of dust, Mikey rolling around on the ground screaming, and his bike about 10 feet behind him. I run to him to see what happend. He was in too much pain, and he couldn’t move or anything. So I do my best to try to help him, but the pain on his left shoulder was too much. 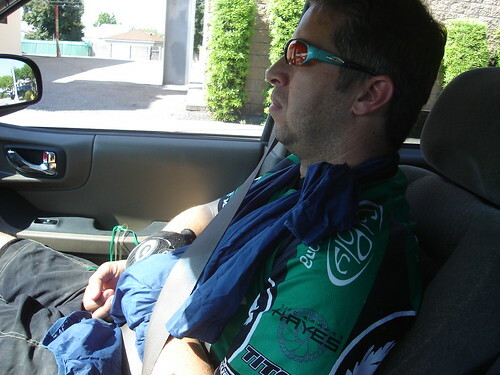 I was able to at least get him to sit up and I took a wind breaker from his Camelback and made a sling for his arm. I then called his wife to tell her that he had hurt himself, not knowing exactly what his injuries were, I just told her that he either broke something or dislocated it. Riders and runners kept passing us, people asked if were ok, but obviously Mikey wasn’t. But the most interesting thing happend. This stranger named Sal stopped by and helped me get Mikey up on his feet. He even walked with us all the way to the car, it was about 2 miles. He gave up his ride to make sure Mikey was ok. So what’s the moral of the story? Don’t listen to your MP3 player while riding your bike, you could get hurt! Yeah we look cool. But he paid over $50 for his shirt, I paid $8 at Old Navy for mine. I’m not into the logos and stuff. So is the bike okay?!?!?! That had nothing to do with the MP3 player. No criticism, but I’ve ridden to school all the time with an iPod. I’ve never been hurt because of it. That’s fine if you ride to school with your MP3, but I’m sharing this unfortunate story to prevent others from getting hurt. Yeah this has more to do with the new brakes or whatever, however, I don’t think i would listen to anything while riding, cars are careless sometimes. what if you keep the music low enough to hear the ppl/sounds around you, and if an earphone falls our of ur hear, u can stop the bike and pull over safely, and then fix it???? thats okay, right?